During periods of severe thunderstorms with the possibility of tornadoes, Northwestern personnel closely monitor weather information and will notify students and employees to take shelter if needed. The City of Alva will activate its tornado sirens if a tornado threatens the community. Northwestern will use social media (NWOSU Facebook and NWOSU Twitter) and the emergency text alert system to relay information. First floor of the Science Building in the east-west hallway. Basement of the Education Center. Access is available by elevator. Bottom floor (first) bathrooms of Jesse Dunn. South end of the main north-south hallway of the Health and Sports Science Education Building. First floor and interior hallway of all Residence Halls. If you are unable to seek shelter in any of these facilities, then move indoors as quickly as possible and move to an interior hallway or small room at the lowest level of the structure away from windows. Avoid upper floors, large glassed areas, gymnasiums and auditoriums. At the Enid Campus, students and employees should move to bathrooms on the first floor or into the mail room adjacent to the north hallway. 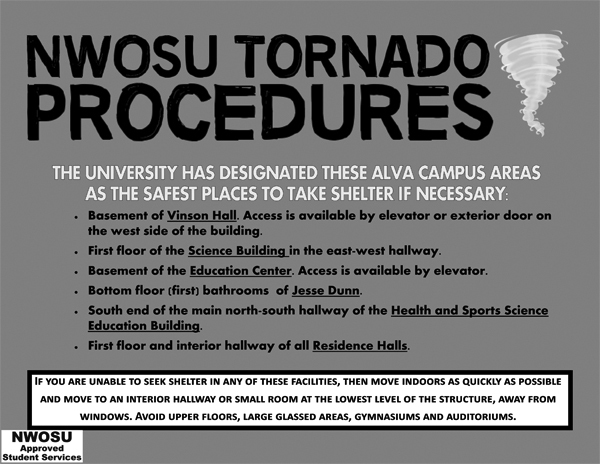 At the Woodward Campus, employees should seek shelter in rooms 141 or 124. Please take time to familiarize yourself with these shelter locations and have an evacuation plan in place. Don't be scared, be prepared.